Algeria: Fall of more than 47% of the trade deficit over the first 4 months 2017 - The Maghreb Times ! 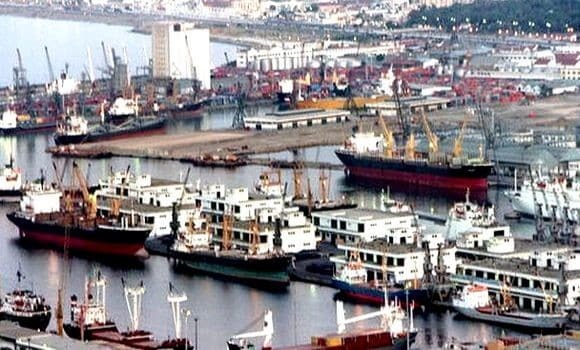 Algeria’s trade deficit amounted to US $ 3.5 billion in the first four months of 2017 compared to a US $ 6.63 billion deficit over the same period of 2016, A decrease of 3.13 billion usd corresponding to a decline of 47.2%, learned the APS from the Customs. Exports increased to 11.92 billion usd between January and end of April of the current year against 8.81 billion usd over the same period of 2016, an increase of 35.3% corresponding to an increase of 3.11 Mds usd, said the National Center for Computer and Customs Statistics (CNIS). For imports, imports fell slightly to 15.42 billion usd in January-April 2017, compared with 15.44 billion usd in January-April 2016, a decline of 0.14%. Exports accounted for 77% of imports as against 57%. Owing to the upturn in oil prices from somewhere between 50 and up to $ 57 in January-April, hydrocarbon exports, accounting for 94.26% of total exports, reached 11.236 billion usd against 8.205 billion dollars Usd at the same period of 2016, up almost 37%. Non-hydrocarbon exports (5.75% of total exports) increased to US $ 685 million from US $ 606 million, an increase of 13.04%. Non-hydrocarbon exports consisted of semi-finished products with US $ 535 million (US $ 466 million), food goods with US $ 99 million (US $ 97 million), gross US $ 26 million (US $ 20 million) Industrial equipment with 20 million usd (against 18 million usd), and non-food consumer goods with 5 million usd (same amount over the same period of 2016). In terms of imports, of the four (4) groups of imported products, two (2) declined: goods for the production tool and non-food consumer goods. Imports of food products rose to 2.82 billion usd against 2.62 billion usd (up 7.8%), while capital goods rose to 5.97 billion usd against 5.36 billion dollars Usd (+ 11.3%). On the other hand, imports fell in the goods group for the production tool to 4.45 billion usd against 4.84 billion usd (-8.1%) and non-food consumer goods to 2.18 billion Usd against 2.63 billion usd (-16.75%). Of the 15.42 billion usd of recorded imports, amounts of 9.37 billion usd were paid per cash (60.7% of imports), an increase of 4.8% in cash payments compared to The same period of 2016. Lines of credit financed imports to the tune of 35.8% in the amount of 5.52 billion usd (-5.52%), while the foreign currency accounts financed imports for an amount of 5 million usd . The rest of the imports were financed by the use of other means of payment of 526 million usd (-22.7%). Algeria’s first five customers in the first four months of 2017 were Italy with 2.14 billion usd of Algerian exports (18.01% of total Algerian exports), followed by Spain with 1 , 43 billion usd (12.02%), France with 1.29 billion usd (10.89%), the United States with 958 million usd (8.04%), and the Netherlands with 753 million Usd (6.32%). As for Algeria’s main suppliers, China remained at the top with 3.15 billion usd of Algerian imports (20.47% of Algeria’s total imports), followed by France with 1.31 billion usd (8.5 %), Italy with 1.08 billion usd (7.02%), Germany with 1.01 billion usd (6.6%) and Spain with 954 million usd (6.2% ). American report: Algeria likely heading to unstable future . Trade reaches 9 bn between Italy and Algeria..